This webpage features key figures, related resources, and lesson plans, videos and visualizations reviewed by CLEAN for all the NCA key messages for the region. The page contains information that will help educators and students gain a deeper understanding of climate science and the implications of climate variability and climate change for Southwest region. How are farmers, water utilities and state agencies in the region planning to address drought and long-term reduction in water resources? Does your community have a drought or water conservation plan? If not, what are the elements of a good plan? What sorts of job opportunities could emerge related to water conservation and drought planning? 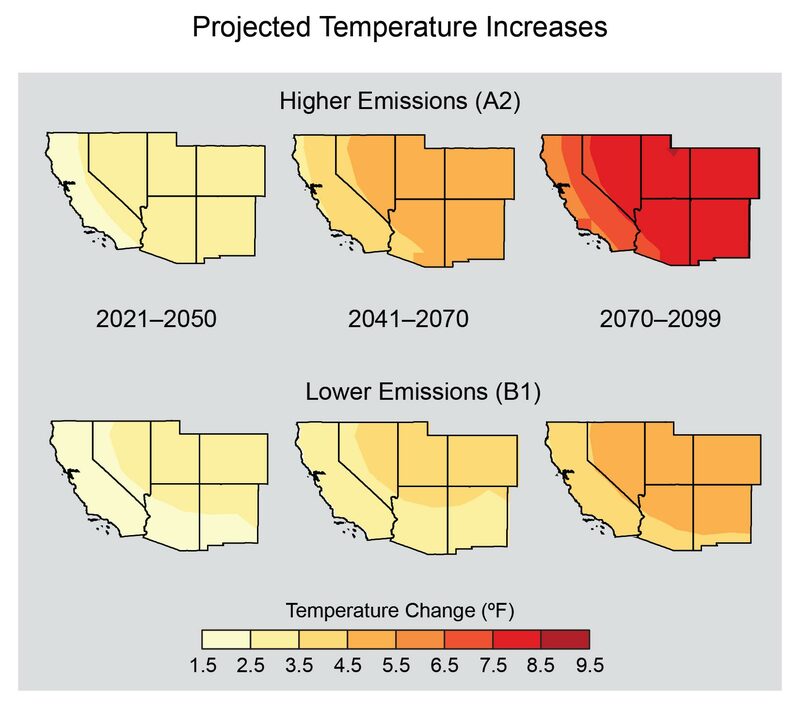 Maps show projected changes (temperature) in average, as compared to 1971-1999. Top row shows projections assuming heat-trapping gas emissions continue to rise (A2). Bottom row shows projections assuming substantial reductions in emissions (B1). (Figure source: adapted from Kunkel et al. 2013). 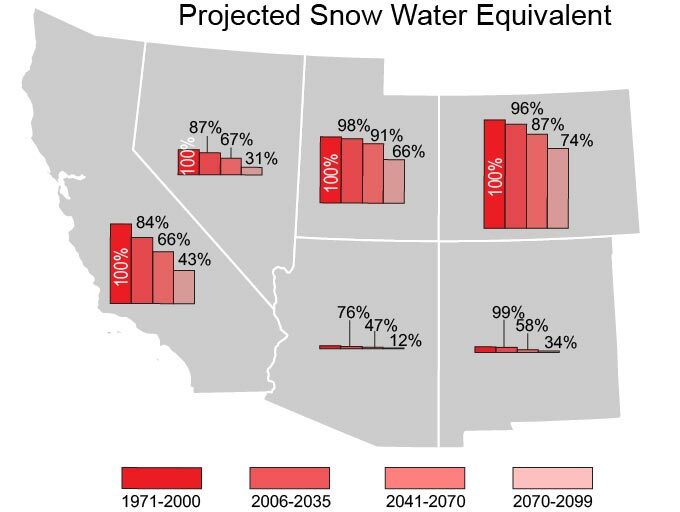 This EPA page and text demonstrates changes in the snowpack from 1955-2013 in the Western US (not solely the Southwest). 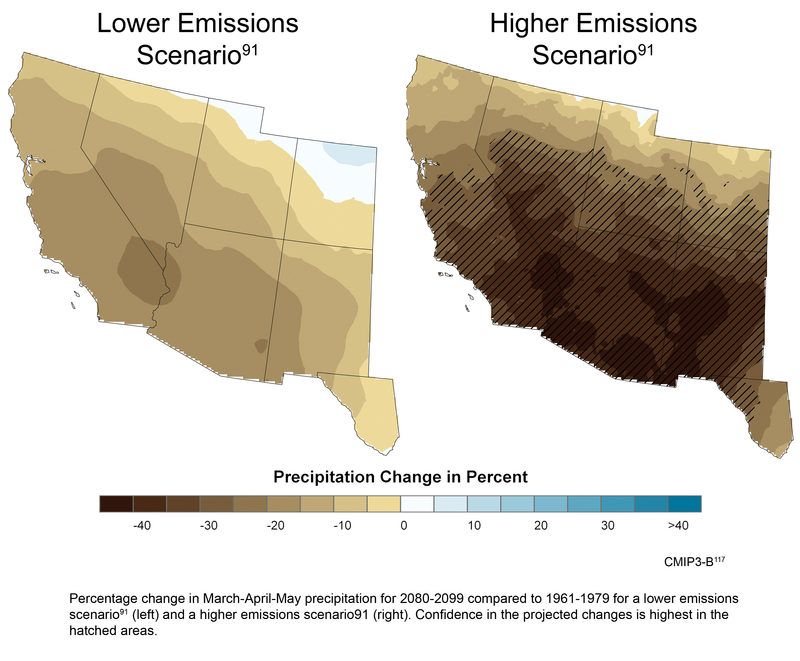 This activity addresses climate change impacts that affect all states that are part of the Colorado River Basin and are dependent on its water (many southwestern states). Students examine available data, the possible consequences of changes to various user groups, and suggest solutions to adapt to these changes. This is an interactive map of California and the Sierra Nevada mountains, showing projected variations in water stored in snowpack, from 1950 to 2090, assuming low or high emission scenarios over that period of time. Interactive can be adjusted to show different months of the year and various climate models, graphed by site. What are the key agricultural products in your region? How are they currently being impacted by changing climate and what is being done to prepare for future changes? What opportunities are there to change practices to become more resilient and sustainable? The frost-free season is defined as the period between the last occurrence of 32°F in spring and the first occurrence of 32°F in the subsequent fall. 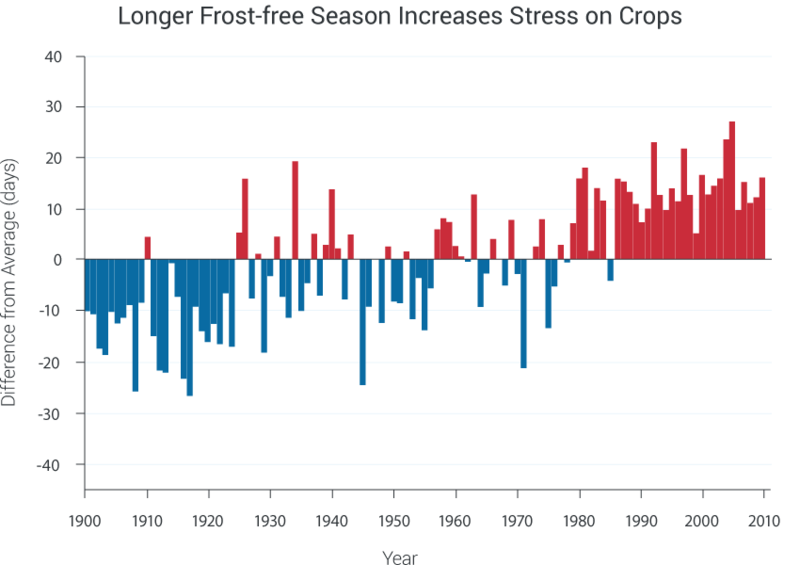 The chart shows significant increases in the number of consecutive frost-free days per year in the past three decades compared to the 1901-2010 average. Increased frost-free season length, especially in already hot and moisture-stressed regions like the Southwest, is projected to lead to further heat stress on plants and increased water demands for crops. Higher temperatures and more frost-free days during winter can lead to early bud burst or bloom of some perennial plants, resulting in frost damage when cold conditions occur in late spring (see Ch. 6: Agriculture); in addition, with higher winter temperatures, some agricultural pests can persist year-round, and new pests and diseases may become established.77 (Figure source: Hoerling et al. 20135). Contains some good information about the effects of drought on farming/ranching in CA, but is not scientific (no citations, etc.). In this activity, students investigate aspects of change in the biosphere of California's Central Valley. Analyzing data over both space and time, they begin to tie together some of the causes and effects of a variable and changing climate. The valley serves as a model environment that includes riverine, wetland, rural-agricultural, and urban regimes all with high water-dependencies and susceptibility to drought. This NASA video explores the relationship between climate and agriculture, including the variability of climate change impacts that may occur in different regions and the effects of population growth and higher demands for food in areas that already struggle to supply food for the people. The video highlights the need for accurate, continuous, and accessible data and computer models from NASA satellites to track and predict the challenges farmers face as they adjust to a changing climate. Wildfire doesn’t only occur in forested regions. What are the wildfire risks in your region? What is the history of wildfires in your area? What groups are organized to mitigate and fight fires, and what jobs are associated with them? The figure shows a conceptual climate envelope analysis of forest vulnerability under current and projected future ranges of variability in climate parameters (temperature and precipitation, or alternatively drought duration and intensity). Climate models project increasing temperatures across the U.S. in coming decades, but a range of increasing or decreasing precipitation depending on region. Episodic droughts (where evaporation far exceeds precipitation) are also expected to increase in duration and/or intensity (see Ch. 2: Our Changing Climate). 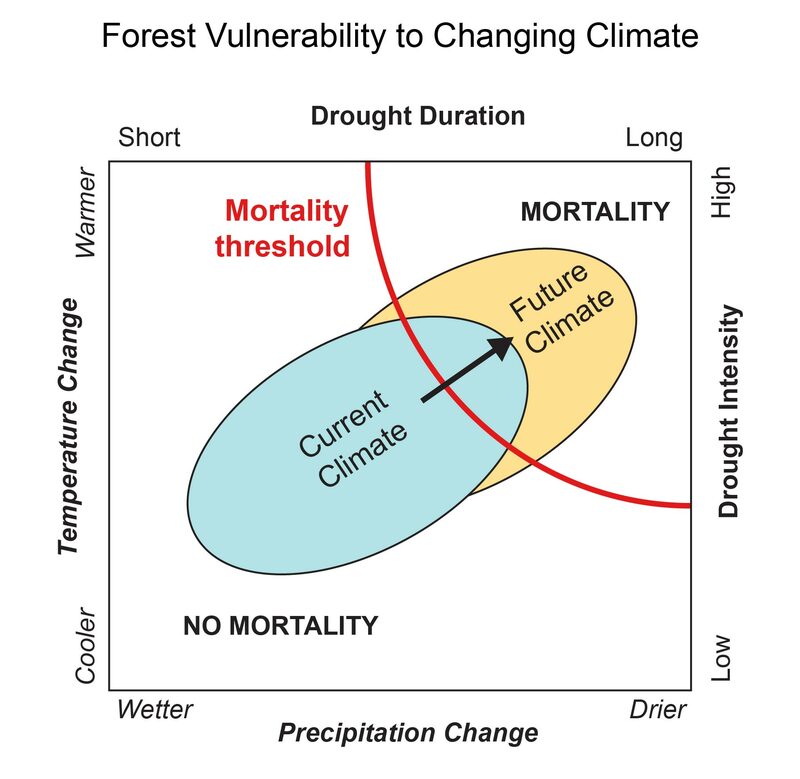 The overall result will be increased vulnerability of forests to periodic widespread regional mortality events resulting from trees exceeding their physiological stress thresholds.3(Figure source: Allen et al. 2010 3). The relationship between wildfire frequency, temperature, and snowmelt from 1970-2005 (slightly outdated, but still relevant). Even if you don’t live along the California coast, everyone in the Southwest is potentially impacted by sea level rise since many goods used in the region enter through California ports. What products in your community come through these ports and how might increased sea level rise lead to new job opportunities? King tides, which typically happen twice a year as a result of a gravitational alignment of the sun, moon, and Earth, provide a preview of the risks rising sea levels may present along California coasts in the future. While king tides are the extreme high tides today, with projected future sea level rise, this level of water and flooding will occur during regular monthly high tides. During storms and future king tides, more coastal flooding and damage will occur. The King Tide Photo Initiative encourages the public to visually document the impact of rising waters on the California coast, as exemplified during current king tide events. 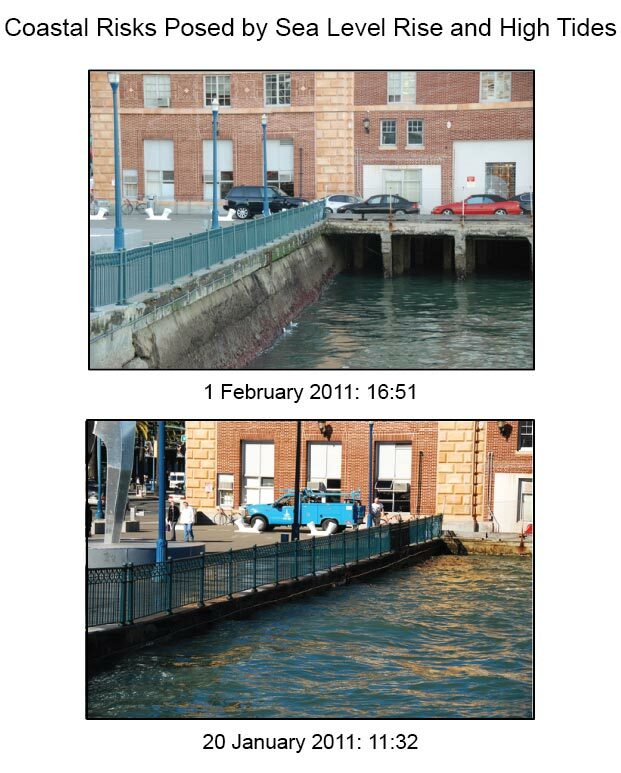 Photos show water levels along the Embarcadero in San Francisco, California during relatively normal tides (top), and during an extreme high tide or “king tide” (bottom). (Photo credit: Mark Johnsson). Estimated, observed, and possible future amounts of global sea level rise from 1800 to 2100, relative to the year 2000. Estimates from proxy data1 (for example, based on sediment records) are shown in red (1800-1890, pink band shows uncertainty), tide gauge data are shown in blue for 1880-2009,2 and satellite observations are shown in green from 1993 to 2012.3 The future scenarios range from 0.66 feet to 6.6 feet in 2100.4 These scenarios are not based on climate model simulations, but rather reflect the range of possible scenarios based on other scientific studies. The orange line at right shows the currently projected range of sea level rise of 1 to 4 feet by 2100, which falls within the larger risk-based scenario range. The large projected range reflects uncertainty about how glaciers and ice sheets will react to the warming ocean, the warming atmosphere, and changing winds and currents. As seen in the observations, there are year-to-year variations in the trend. (Figure source: NASA Jet Propulsion Laboratory). In this activity, students will practice the steps involved in a scientific investigation as they learn why ice formations on land (and not those on water) will cause a rise in sea level upon melting. This is a discovery lesson in ice and water density and displacement of water by ice floating on the surface as it relates to global climate change. In this activity, students investigate how sea levels might rise when ice sheets and ice caps melt by constructing a pair of models and seeing the effects of ice melt in two different situations. Students should use their markers to predict the increase of water in each box before the ice melts. This video highlights a variety of current climate change research initiatives from scientists at the University of Colorado, Boulder. It describes the changing dynamics of Antarctic ice sheets and glaciers and the impacts of reduced Arctic sea ice on people, animals, and global albedo and sea levels, while providing a glimpse of the excitement of this field research through interviews and video clips of scientists in the field. "We are a coastal country," says Susanne C. Moser, a convening lead author for the National Climate Assessment's Coasts chapter, with 94,000 miles of coastline and more than $1 trillion in coastal infrastructure. Coastal lifelines, such as water and energy infrastructure, and nationally important assets, such as ports, tourism, and fishing sites, all are increasingly vulnerable to sea level rise, storm surge, erosion, flooding, and related hazards. What steps are being taken on a local level to prepare for heat events and possible disruptions to energy and water supplies? What are ways that students and citizens can get involved to help communities become more heat-ready? The projected increase in heat waves in Southwest cities (Ch. 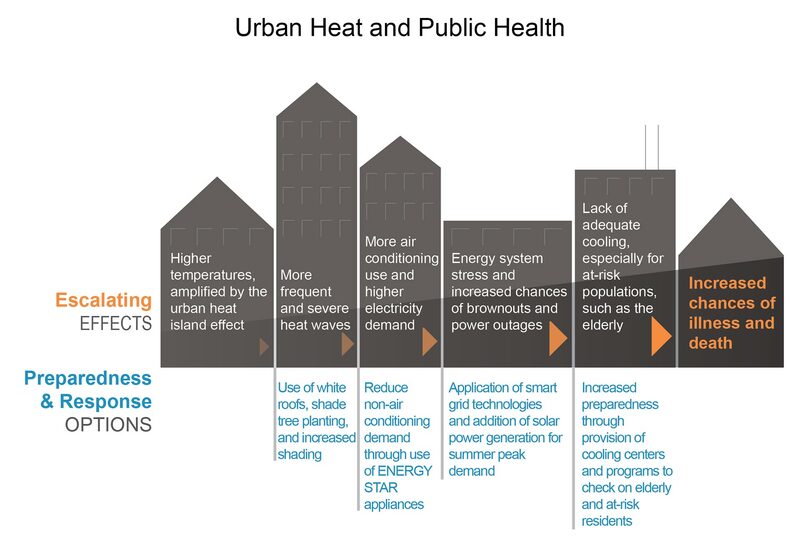 2: Our Changing Climate, Key Message 7) increases the chances that a chain of escalating effects could lead to serious increases in illness and death due to heat stress. The top of the figure provides some of the links in that chain, while the bottom of the figure provides adaptation and improved governance options that can reduce this vulnerability and improve the resilience of urban infrastructure and community residents. This EPA guidebook provides critical information that local public health officials and others need to begin assessing their excessive heat events (EHE) vulnerability and developing and implementing EHE notification and response programs. As part of the President’s Climate Action Plan and ongoing efforts within the US Global Change Research Program (USGCRP), the Interagency Crosscutting Group on Climate Change and Human Health (CCHHG) and a subset of the Interagency National Climate Assessment Task Force (INCA) have initiated an interagency Special Report on the impacts of observed and projected climate change on human health in the United States. In this 3-part lesson, students explore California climate and factors that are leading to changes within this climate system. Students begin by exploring California's climate and the state's topography. Next, they investigate coastal versus inland climate. Finally, they use My NASA Data to explore the effects of El Niño/La Niña on two locations found at the same latitude.